Herbs and spices pair wonderfully to add flavor and aroma to dishes. They also provide numerous health benefits. Traditional Chinese and Indian therapies use herbs to aid physical and emotional ailments. Here are 12 herbs that will please your palate and ease your stomach. Rosemary is a pine-like shrub. Its leaves can be used in savory dishes to give an earthy flavor and aroma. Rosemary is great for alleviating pain. This herb is considered a botanical nervine, which means it has a beneficial effect on the nervous system. It can be used medicinally to help reduce the symptoms of digestive imbalance, such as an upset stomach, spasms and dyspepsia. Rosemary can be used to complement the flavors in stews, meat, potatoes and root vegetables. Popular as a sleep aid, valerian root can actually reduce symptoms of many digestive disorders, including irritable bowel syndrome and viral gastroenteritis. Valerian can help soothe an upset stomach and relieve gas, bloating, constipation, cramps and nausea. Valerian root can be purchased in capsule, powder or leaf form in supplements and herbal teas. Turmeric has received a lot of attention recently due to its ability to promote brain health. It has been used for centuries in Indian cuisine and Ayurvedic medicine, as well as in Chinese medicine. Turmeric is anti-inflammatory and is commonly used for digestive disorders and liver health. According to the World Health Organization, it is effective when used in treating dyspepsia, acid reflux and flatulence. It also works to calm the GI tract and is effective against ulcerative colitis. Turmeric is a feast for the eyes and the taste buds. It has a bright yellow color and provides a warm, earthy taste to rice dishes, stews, soups and sauces. Cumin is commonly found in Latin American cuisine due to its savory, smoky flavor. It improves immune function and can help with a host of gut and intestinal problems. Cumin can be used to treat bowel spasms, gas, diarrhea, colic and bloating. Cumin is often coupled with meat, beans and peppers. Fennel seeds and fennel leaves are used in Middle Eastern and Mediterranean dishes, as well as in Ayurvedic medicine. Fennel is effective against gas, bloating, constipation, heartburn and colic. Both the seeds and the leaves alleviate symptoms, and prevent problems in the first place. Fennel also helps release digestive enzymes for those who have a diminished appetite. Fennel has a strong liquorice scent and flavor that adds complexity to savory dishes. Dill is another aromatic and flavorful herb that resembles caraway in flavor with a sweet and bitter citrus-like scent. Its name comes from the Old Norse word dilla, which means “to soothe” or “to calm.” Dill is great for promoting gut health and immunity as it is high in vitamin C and is anti-inflammatory. It can help ease symptoms of colic, soothe an upset stomach, and is good for digestion. Dill can be used in fish dishes, creamy sauces, potatoes and spreads. Dandelions are one of the most neglected nutritious herbs as they are often considered to be pesky weeds. They are packed full of vitamins and minerals and can help improve digestion. They can stimulate appetite, relieve bloating, soothe an upset stomach, increase the production of bile, promote good liver health and decrease water weight. Dandelion greens and flowers can be added to teas, stews, salads, or eaten as is. Cardamom is popular in Indian savory dishes but can sometimes be found in herbal teas as well. Cardamom’s main medicinal use is as a digestive aid. It is anti-inflammatory and antispasmodic. It can reduce acid reflux, nausea, bloating, gas, constipation, heartburn and loss of appetite. Both peppermint and spearmint are effective at improving digestive health. Mint leaves can help improve digestion, stimulate bile production, reduce gas, settle an upset stomach and treat colic. Mint leaves can be used in sweet and savory dishes, but they are most often found accompanying sweet or cooling treats. Mint pairs well with fruit, cocoa, lime juice, cucumber and yogurt. You can also experience the benefits of mint by adding some leaves to tea or by chewing on a leaf directly after a meal. Another herb that goes well with sweet dishes is marshmallow root. Unlike conventional marshmallow treats, marshmallow root is healthy for you. It is often found in teas and natural desserts. Marshmallow root can be used to maintain moisture in the intestinal tract and improve bile production. It is a natural replacement for a stool softener, without the long list of side effects and warnings. It is also effective against diarrhea and constipation, stomach inflammation, stomach ulcers and urinary tract infections. Caraway is another herb that can be used in both sweet and savory dishes. It is frequently used in Mediterranean and European cuisine. Our daily requirement for fiber can be gained from just 100 grams of caraway seeds! This herb is therefore effective for both preventing constipation and reducing transit time in the GI tract. It has been shown to protect the colon against cancer, soothe digestive disorders, increase appetite, and relieve infantile colic. Ginger root is powerful against inflammation and is often used by people suffering from arthritic pain and rheumatism for that very reason. It can also combat stomach inflammation, and improve the immune system by protecting the gut. Ginger can calm the GI tract, reduce nausea, increase gastric emptying, aid digestion, protect against ulcers, stop vomiting, and actually strengthen the stomach and intestines. Ginger root can be bought whole, powdered, in tea or in a supplement. Good digestion is far more than just making sure you poop regularly. Anytime you feel gassy, have stomach pain, heartburn or even a weak immune system, you are suffering from digestive problems. These twelve herbs can help combat these problems and ensure a strong, healthy gut and GI tract. 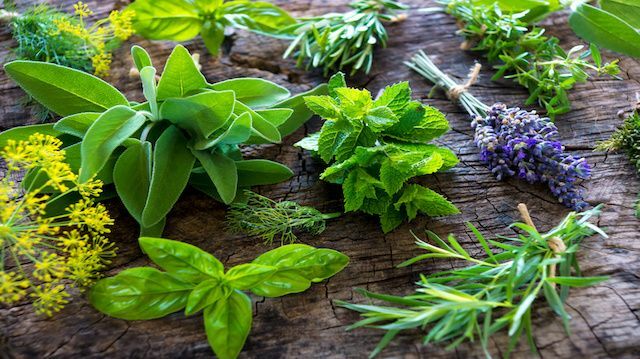 Which one of these herbs have you found to be helpful in combating digestive issues? Leave us a comment below and let us know what has worked for you. Hey Buddy!, I found this information for you: "Herbs that Banish Gas, Bloating, Heartburn and More". Here is the website link: https://www.thealternativedaily.com/herbs-that-banish-gas-bloating-heartburn/. Thank you.